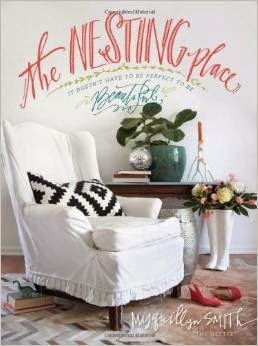 My friend Alison recommended that I read The Nesting Place (for part of my 2015 Facebook Challenge) and so I did. I wasn't sure at all what to expect but I gathered that it was a book on home decorating and, well, I always like those. I like to glean from them, if not read them outright. What I didn't realize when I picked up a copy of the book was that it was written by the blogger at The Nester. (I used to participate in her Christmas Tour of Homes. It was fun and I enjoyed it for awhile there.) At any rate, I sat down with this book and was instantly sucked into it. I read every single word and enjoyed the large majority of them. Alison indicated it was a book to be loved and it is! Now for those of you who don't do decorating books, hear me out before you cross The Nesting Place off your list. If at the end you still don't feel like this book is for you, well, then we'll just move along. While most "professional decorators" want to tell you what to do and what not to do in your house, Myquillyn (how do you pronounce her name?) has no such desires on you or your household. She has a relaxed style of writing (and decorating) which allows you to rest comfortably within your own skin. She's not trying to make you and your home into something that neither of you are. Rather, she is trying to build a relationship between you and home, helping you to better understand yourself, your family, your needs, and your space, so that you can make it everything that you would like it to be. Smith mentions that most decorating type of books market themselves to home owners and so hers is unique in that she writes with renters in mind. Why? Because she (up to the point of this book's publication) was a renter herself and had to make decorating decisions based on her family's needs inside a home that they did not own for themselves. All of the pictures contained in this book (and there are a great many) are of her rental house. From the looks of things, she has certainly made it a lovely, charming place to be. She makes the point over and over again that you need to be the one that is most satisfied and happy with your home. Your home needs to be arranged, ordered and decorating to suit the liking of those that live within it. She works tirelessly to remove fear from her readership over putting nail holes in the wall and/or picking out paint colors. She is not a perfectionist and therefore does not demand that of others. She strongly encourages freedom to be creative and experiment until you find out what you like. Smith very much wants to encourage her readers to dare to try things without worrying about whether or not they will be perfect. She points out that if you are always waiting for a perfect thing to come along then you will forever be disappointed. She inspires her readers to be content with the home and the things which God has graciously given them so that they can settle in and create a warm, loving, beautiful environment to live in with their family. If you are uncertain about how to decorate you should know that this book is not going to tell you things like, "Put your couch here and your chair there." Instead she's going to encourage you to move the furniture around (it's a free activity!) until you find out what works best for you. She's going to encourage you to paint (and then repaint if you don't like the color after all). She's going to encourage you to do something, rather than nothing so that your love for home will grow. I thought it wonderful encouragement and good advice for people in general. You and your ideas do not need to meet any financial status before being able to glean from this book and be encouraged by her words. The pictures of her house indicate that she's made a fair amount of mistakes and that she is highly imaginative and creative but that didn't make me feel the least bit intimidated or frightened. Instead I felt encouraged to take another look around my house and see what might be changed in order that my family would find an even greater enjoyment in our home than we already do. (We do love our home but there are spaces which still puzzle us when it comes to deciding on their purpose.) In my opinion, there is always something to learn about furniture arrangement and home decor and I loved this book for the simple, practical, encouraging advice which it offered. Added bonus: the book is simply beautiful to look at. I have looked at her blog occasionally and I like her advice about things not having to be perfect to be beautiful and that we can put things up in unconventional ways - in one post I remember she nailed her window treatment to the wall itself instead of using a curtain rod. I don't watch many decorating shows, but when I do I am astounded at the attitude some professional decorators display towards the people living in the home and their desires. I think books like this are needed to assure us that there are many ways, not just one right way, and that what's most important is that you love your decorating and it works well for your family. I almost put this on the list for my TBR challenge, and I am wishing I had now! But I will get to it some day. I've thought about ordering this one several times. I may have to bite the bullet and get it. I checked this book out from the library just to browse through. Needless to say I am over half-way through the book and am really enjoying it. Monica loaned me her copy this summer, and I loved it. Definitely one of my favorite books I read last year. The longer I'm away from this book, there more I like it, and realize I'll probably reread it. Many of the things she talked about has stuck with me on my decorating, which I appreciate!